Bishop Alexis Thomas, the nationally renowned senior pastor of Pilgrim Rest Baptist Church and a towering figure in Arizona, died on Jan. 18. He was 50. He is survived by his wife, Dr. Michele Thomas, a retired major in the United States Air Force, and five sons, Shimond, Remone, Jamell and twins Micah and Micaiah. Micah, a junior at Grand Canyon University, is studying business administration in the Colangelo College of Business. Thomas’ passing touches many in the GCU community and beyond who knew him personally, worked alongside him or attended Pilgrim Rest services in Phoenix or Gilbert. “He was a large presence, a visionary, a man of God who made time for people regardless of their economic status or station in life,” said Ardith Matthews, a GCU University development counselor who knew him personally. Born in Phoenix on Nov. 9, 1967 to the Reverend and Mrs. Hubert Thomas, Alexis was the third of four sons. At age 7 he received his first license to preach the gospel, and after serving as Associate Minister at the Pilgrim Rest Baptist Church, he was named Senior Pastor at age 16. Under his leadership, the church grew from 250 to more than 4,000 members and was built into a three-pronged campus with a Worship Center, World Center and Wellness Center. His first book, “A Child Shall Lead Them,” was published in 2005, and he was ordained as the Bishop of the State of Arizona in the Full Gospel Baptist Church of New Orleans in 2003. He held many positions of prominence, including serving on the Board of Directors of the Greater Phoenix Black Chamber of Commerce, as the General Chairman of the African American Christian Clergy Coalition, which he founded in 2001, and as co-founder of the African American Strategic Alliance Coalition in Phoenix. In a statement, Phoenix Mayor Greg Stanton described Thomas as “one of the greatest men I ever knew. … In so many ways, he was the soul of our city. I am devastated by the news of his passing. Dr. Tim Griffin, GCU’s Pastor and Dean of Students, said Thomas will be mourned by many at GCU. “He was a well-respected leader in the City of Phoenix and had a tremendous influence on the city itself and had an influential congregation that had a wonderful impact around downtown and the Valley,” Griffin said. I just want to thank GCU for all your prayers and support. Bishop Thomas and I are cousins. I was there when he preached his first sermon at Calvary Baptist Church in Santa Ana, CA at the age of 7 years old. It does my heart good to know that I work for a University that supports and acknowledges such an AWESOME Man of God. Thank you so much for this acknowledgement. Our Bishop was such a light in the lives of so many of us. His presence and laughter will be missed. His singing will be missed. His smile and deliverance of the Word will be missed. He was a GREAT man of God and of faith. He was and still is our spiritual father. He was our spiritual guide, our spiritual compass. This tribute means so much. We will get through this and we will rise again with a greater strength and presence than ever before. God is still good and he is still faithful, even as we mourn. Thank you. To my GCU family, thank you for acknowledging Bishop Thomas. Bishop was an amazing Man of God. Through his vision and guidance our congregation thrived, supported our community and reached beyond the state of Arizona. Bishop declared that we as a congregation and body of Christ would “Occupy All Streets”. Bishop could deliver a message that the young and old alike would comprehend. He was a great teacher and visionary. Bishop Thomas is and will always be missed in the hearts of his congregation and all who loved him. Thank you for your prayers and kind words as we mourn the loss of this extraordinary gift we were blessed with for such a short time. Well done, Bishop! Well done! Bishop Alexis Thomas was a great visionary and leader. Prayers going out for his wife, children, father, brother, congregation and friends. Bishop Thomas surely will be missed. I am lost for words. I can’t tell it all from the five years I was there in Arizona what an awesome man of God who will truly be missed by so many. But you take your rest Bishop Thomas. Fly high til we meet again. There will never be another one to fill those tall shoes. The word you gave us, the jokes, the singing, your press re wine forever in my heart… I’m thankful for the opportunity to have met such a true man of GOD. Praying for the family and the church here in Louisiana. I remember being raised in the same neighborhood with Bishop Thomas and watching with amazement as he pursued his purpose of teaching and preaching the word of God. I could write a novel about his character and unselfish nature which is why he made a great impact on our city. He has been a great support to my husband’s family over the years, even taking time out to visit them in the hospital. He will truly be missed and has left a great legacy in this world. 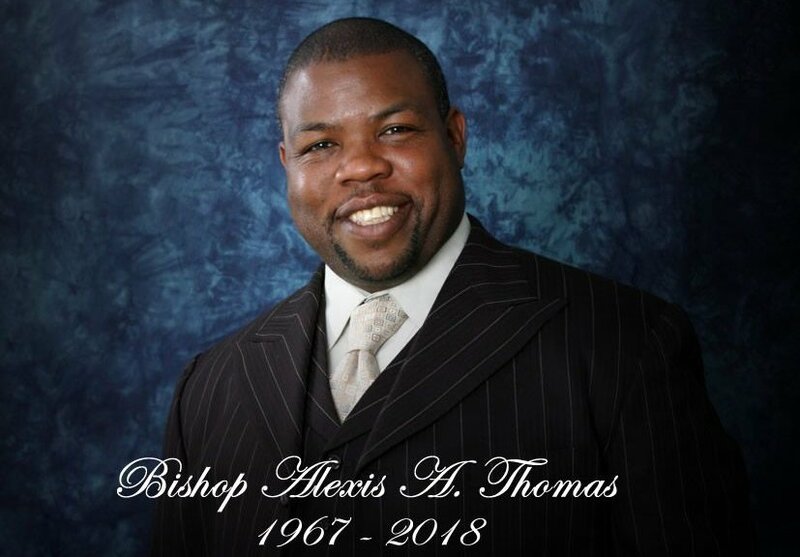 I will FOREVER remember my Bishop Alexis A. Thomas. He changed my life in so many positive ways, words can not explain, but I will forever be thankful and grateful. I’ve been at Pilgrim for 51 years and have known Bishop since he came there at the age of 12 years old. We went from calling him Alexis to at the age of 16 he became Pastor to Bishop. He was definitely a visionary and loved his members. I will miss him deeply. Praying for First Lady Michelle Thomas, his children, grandchildren, his father and brother and the rest of the family. His spirit lives on! My condolences to Bishop Thomas’s wife, children and family. And pray we all who love him find peace and understanding for God’s reason for calling this young soldier home. Although I never met Bishop Thomas in person, I was informed about this awesome man of God by my aunt and cousins who reside in Phoenix, Arizona. I was absolutely spell-bounded to learn that he began shepherding Pilgrim Rest at the young age of 16! It is absolutely amazing of how God used Bishop Thomas to bless the lives of so many. From what I have discovered and read, Bishop Thomas was the quintessential leader. This servant of God accomplished in ministry what it takes pastors double his age to accomplish! To God be the glory for a life well lived and a legacy that will continue to bless and influence the masses. Well done my good and faithful servant! I’ve known Bishop Thomas at least 35 years. He has been such an inspiration to me and my family. I enjoyed being a member. He inspired me, uplifted me, and also encouraged me within his preaching. I will truly miss him. Prayers go out to his wife Michelle , his sons and grandchild. You will never be forgotten. I remember hearing Bishop Thomas preach when he was 8 years old at my church in Florence, AZ. He was so short he stood on a milk crate to deliver GOD’S WORD. Prayers going out to church family and immediate family. He was a true MAN of GOD. In 2008 I was released from prison… I didn’t want to do the usual like going out to eat or to my mom’s house… I went straight to Pilgrim Rest. I got baptized that following year; completed new member classes too. Bishop is my spiritual father and my church family Pilgrim Rest… my home church. Bishop Neil C Ellis said it… God called my pastor to preach at a young age and God called him at a young age. 33years of service, hard work, blood, sweat and tears and most importantly Word of God and Prayer… and Lord Jesus Christ said it was finished at the age of 33 too. DIVINE CONNECTION. My Bishop; I was in disbelief for days after a friend told me Bishop passed. I said to her, “Don’t play with me!” And still did NOT believe it, until I researched it. I had recently relocated from Phoenix. I am so glad that I was able to see Bishop back in June; I was beyond excited when I saw First lady Michele (spelled the wrong way) at the East Valley campus in June too; I hadn’t seen her in so long. I always use to ask sister Barnes about her when I would run into her at the salon, or when I visited Pilgrim. I am honored to have seen them both. Bishop Alexis Thomas was my Bishop from 2005, when I officially joined the church, until I joined LWBC in 2012. I would occasionally visit both campuses. Pilgrim had the BEST choir by far; when Bishop would sing, I was mesmerized. My heart actually ached so much upon hearing about his death. I went in and out of dismay, until the Lord told me AGAIN, yesterday, that Bishop, First lady Michele, his boys, family and church family will be taken care of. God told me to continue living and remember the good things about Bishop. Today, 1/28, I was able to hear Bishop singing; I remembered some of Bishop’s sayings, “Y’all ain’t helping me!” And when he talked about being from South Phoenix on I think, 24th Street, around the corner from I think, the trailer park. Oh my, what an awesome man. I’ll never forget back in, I think, 2011, when I fell on a hard times… I went to Pilgrim, my old church, and Bishop helped me; my gosh. Praise God. Bishop is loved, he will be remembered, and God has him. Keep living First lady. Michelle Phillips (with 2 L’s; spelled the right way, lol). My daughter and her family moved to Phoenix, Arizona 2 years ago. My husband and I visit our daughter often throughout the year, and spend 4 months of the winter with her. When diligently searching for a church home in Phoenix we discovered Pilgrim Rest, and hence Bishop Alexis Thomas and his wonderful congregation. We had found our church home! We are truly blessed to have been able to experience the spiritual guidance of this beautiful man of God. We loved his sermons. We love his church (especially the youth ministry that our grandsons enjoy so much). Pastor Thomas was so gifted in his delivery. He had the most beautiful smile that would light up the pulpit, and a laugh that came from the depths of his soul. He had such an unbelievable joyful presence about him. I can still hear his soulful voice as he sang the Sunday before he passed. My heart hurts at his unexpected passing. I will miss him dearly. Our prayers go out to his family at this time of loss. Thank you Bishop Alexis Thomas for being such an inspirational and loving man of God. Awesome, breathtaking, humorous but yet such fulfilling messages each and every time that I received the word from Bishop Alexis Thomas. He has always been there for the community in times of need whether it was grief or just general uplifting. May God continue to uplift each and every one of us. As he transcends, let us remain uplifted and live the life that he talked about in Jesus name I pray. There will certainly not be a replacement but we pray that God will send us an angel that is equivocal and expedient and getting the word through to us. Bless you my sister and brother on today and days to follow. In Jesus name, amen. Words cannot express the gratitude that I have for the Pilgrim Rest family staff and the late great Alexis Thomas. Bishop Thomas was a man among many. He touched everyone. We will miss you. May God continue to elevate and uplift us today and every day going forward. May God transcend the spirit and the love of Bishop Alexis Thomas. Love you Myrtle and family. If anyone ever had the pleasure of knowing Bishop from his youth, then you know that he never wavered in his faith even as a youth. He remained steadfast and unmovable. Not only has Pilgrim Rest lost the greatest preacher Arizona has ever seen, but the world has lost the best friend they’ve ever had. I am glad to know Bishop Thomas is in a BETTER place. Absent from the body present with the Lord. I know him from full gospel, I know him from serving in the Kingdom, and I know Bishop Thomas from GCU. He will be truly missed by all …. He was a very impactful Preacher. I first learned of him while away in college living in the Phoenix area. He would come visit FIBC and once given a chance to have acknowledging words he would spiritually explode and powerfully minister the word, and he was only 13 years old then. May God greatly reward you in Heaven. R.l.P. in Jesus name.